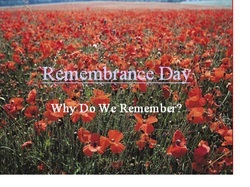 Each Remembrance Day Canadians think about what a great nation we live in. We also think about the people that helped to keep Canada safe and strong. There have been many conflicts since Canada became a nation. In Canada we work very hard to solve our problems without fighting. This does not happen everywhere. Ordinary Canadian men and women left their homes and communities and traveled to these other countries to help end the fighting and keep the peace. (List of conflicts) Most of these individuals volunteered to serve. They worked as soldiers, doctors, nurses, mechanics and other jobs. Many of us either have family members or know someone that has served Canada. Click to see larger poster. 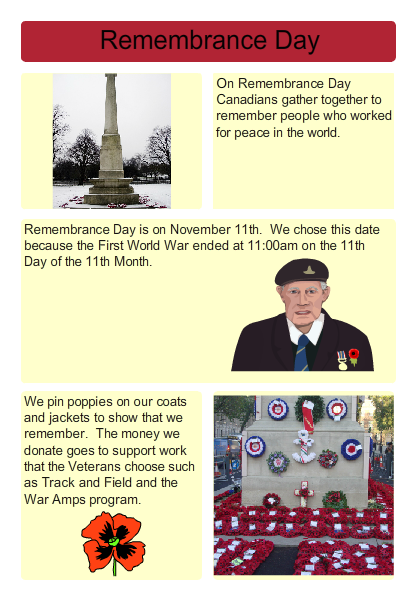 Create your own Remembrance Day poster here. Be sure to use all the words suggested.